As I walked up onto the stage of the large auditorium at the Congre Istanbul Merkezi (Istanbul Congress Center), with my partner of twelve years, Najat Rizk, to collect our AllWorld Network Arabia 500 medals, I was reminded of Bill Gates’ quote about partnerships and success. In our case a truer word could not have been spoken. In no way is the next thought logical or business like but our partnership has an ingredient which to me is akin to magic. Laugh it up if you must but I tell you there is a secret ingredient which made itself known from the first instance. Anne Habibi, one of the co-founders of the AllWorld network, referred to us as the ‘Dynamic Duo’ of the Arab production world. Thanks Anne, you know we are going to be arguing for the rest of the week as to who is Batman and who is Robin? Almost from that first instance there was a synergy between us but it was not necessarily a given. Two women, two film-makers, two ambitions but we shared the same vision, wanted to climb the same mountain, are almost exactly the same age and interestingly, I had named the company for my horoscope and it turned out it was one she shared – so we are both Firehorses. And if you know anything about Firehorses then you know that after the blinkers are off the relationship should go downhill fast. But not for us. I have had other partners, good ones, successful ones but no one like Najat and for her no one like me. Coincidence? Serendipity? Who knows but I do know that though we could have had success solo, together, the lows have not been lonely and getting to the highs has been an adventure worthy of a television documentary. Who would have thought, two women living in a predominantly patriarchal society, would face it head on while making films on Hezbollah, Al Qaeda, Israel’s relationship with Hezbollah, among others and come through it with their reputations made as serious film-makers, setting the stage for Firehorse to become one of the premier production companies in the Arab world for Factual Entertainment. What makes our double act so special? Is it that Najat is a doer and I am a writer? Could it be that her knowledge and love of regional politics and my love of history and of story structure make for one strong film? Is she Robert De Nero to my Martin Scorsese? Too American. Am I David Lean to her Alec Guinness? Too British. Is she Johnny Depp to my Tim Burton? Too weird. We come from different backgrounds, different countries and types of upbringing. She is a child of war torn Beirut, growing up dodging rockets while going to school and inhaling the politics of the middle east with her packed lunch. I grew up in London in the 1980’s. New Wave music, big shoulder pads and whether Boy George was gay or asexual were the landmarks of my childhood. I remember staying home from school when the IRA put a bomb in letterbox. I remember walking past the Iranian Embassy siege in 1980 and wondering what the police were doing surrounding the building and closing all the roads (ok – give me a break I was…young) but that is the extent of violent politics affecting my childhood. My biggest angst was surviving the Opus Dei elements at my school instead of surviving to see another day. So not the same childhood. Not the same early adulthood either but interestingly she did geography and geo-politics at university and I did archaeology and history. Then she became a producer and I became a writer-director and that is where we came together. We have never competed for each other’s positions either while making a film or within our company. In the end I guess I am Mouna to her Najat and that has worked for us over, above and through all the times and different moods that colour our relationship. Looking back at the last twelve years and what made our partnership so special (aside from the magical ingredient) was trust. Trust encompasses so many elements; love, respect, friendship to name a few and whether we are talking films, formats, strategy or having a screaming match, we never lost site of our baby. Firehorse. We created it as film-makers. We are evolving it as creative entrepreneurs. I think I have just coined a new term? Do I get another entrepreneurship medal for that? Pretty please. Finally, as we receive our AllWorld Network medals for being part of the Arabia 500, I would like to thank Anne Habibi and Deidre Coyle the co-founders of AllWorld for a wonderful three days in Istanbul for networking, for learning, for sharing and for a little reflection on the meaning of entrepreneurship, business partnership and extending your hand in friendship and business to people and countries never before on our radar. Namely Pakistan here we come. Hope you are ready for us Firehorses. PS: I am definitely Batman to Najat’s Robin. I am taller. You cannot have a short Batman to a tall Robin – it aesthetically wrong. Ok I am also older…by a few minutes… so that makes me Batman. And finally Batman does not have a Frenchy accent! Yes, I am Batman to her Robin. Too right. 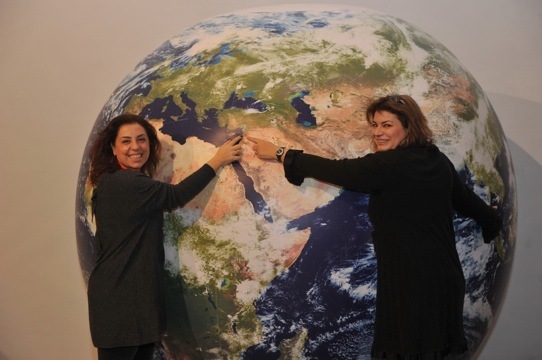 Najat Rizk and Mouna Mounayer conquering the world?